Use this calculator to plan your screen porch using our PVC Screen Wall screening system. This tool will calculate the supplies and components needed for a simple Screen Wall porch installation. If you have project-specific questions or unique requirements, enter your approximate details and submit the form for project feedback. Add the width of all sides and enter the total measurement. If your porch has variable heights or openings with unique shapes, note in comments below. Note: Standard Screen Wall posts are 8 feet. Longer lengths are available but these calculations are based on 8 foot posts. Do You Need a Horizontal Rail? Depending on your porch design, a handrail may be required. This will be used to calculate how many Screen Wall posts you will need. Will You Have an Opening for a Door? Doors can be installed on Screen Wall posts. Based on your desired design, add posts as needed. Do not include door frames or other existing verticals in this number. Do you want pickets below the porch rail? These components fasten to all existing porch structures. Inserts into the channel of posts and perimeter to hide all fasteners and hardware. Connect posts to perimeter and other intersecting posts. Fastens angle brackets to posts and perimeter. Also used for optional pickets. Fastens perimeter to existing framing and structures. Spline is sold in 100 ft packs. This is the total area of screen you will need. The length/width of the screen roll size will vary based on the size of your opening. Now that you've calculated your materials, go to the next step to send an email of your measurements, get pricing and more information on how to order. Screen Wall is a new product and can be purchased online or through retailers or lumber yards. Since the product is so new, if you're buying from a retailer or lumber yard, you will need to provide them information about Screen Tight so that they can effectively assist you. Select how you would like to buy. Choose "I Need Help" if you need assistance estimating materials. This product can be purchased through local lumber yards, 84 Lumber and Builders FirstSource. Find a location using our dealer locator. Since this product is so new, you will need to provide the associate information about Screen Tight so that they can effectively assist you. If you haven't done so already, create a basic sketch of your porch using our planning worksheet and supply it to the associate along with these calculations. Have them email orders@screentight.com to get started. Although Lowe's doesn't stock this product, they can special order it for you. To order from a Lowe's store, go to the millwork desk, typically near back of the store near doors and provide the associate the Lowe’s Vendor Number #62434. Although Home Depot doesn't stock this product, they can special order it for you. To order from a Home Depot store, go to the millwork desk, typically near back of the store near doors and provide the associate the Screen Tight SOS number: #714686. You can buy Screen Wall online here through one of our e-commerce partners. Use the form below to email yourself the calculator results using the form below to make online ordering easy. Please include a message and attach photos & drawings below. If you would like to send yourself an email with this information, enter your details below. 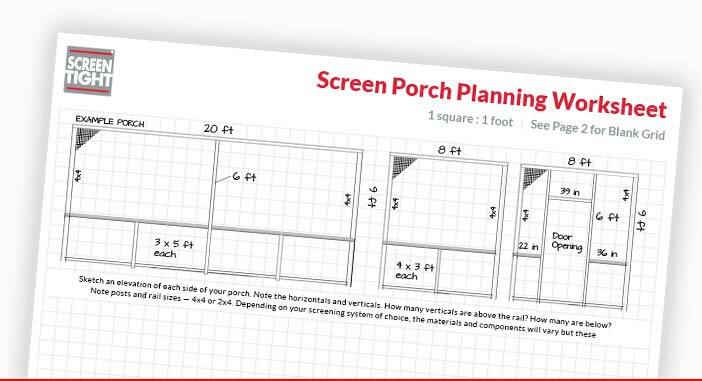 Download our porch planning worksheet to learn how to measure and plan your screened-in porch.